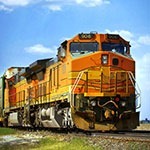 Fuel measurement is important for virtually any diesel or diesel-electric locomotive, including suburban commuter trains, inter-city high speed express trains, and high power heavy-haul freight locomotives. Flow Technology can provide a fuel accountability measurement system that accurately measures the net fuel consumption allowing the operator to analyze the effectiveness of their fuel saving strategies. Even though fuel composition changes due to regional and seasonal fluctuations, precision is critical to maintain. The Flow Technology diesel fuel flow sensors are calibrated using a primary standard calibrator (traceable directly to National Standards) based on a ‘U3’ universal viscosity curve. That way the system can be matched exactly with the fuel being used. Integrated into Railroad companies operation this net fuel system provides strategic fuel management, improved fuel productivity, and reduced fuel theft.